Bodiam Castle - Formidable Fortress or just a Noble Palace? Bodiam Castle was built in 1385 by Sir Edward Dalyngrigge, a former knight of Edward III, apparently to defend the area against French invasions during the Hundred Years' War. There is a constant debate among historians whether the castle was built for military strength or as a romantic country home designed to evoke the ideas of grandeur and prestige. There was a small fortification on the site before the Norman conquest. After the Normans took over, the land passed to the Bodeham family, who lived there for nearly three centuries, strengthening and expanding the structure. Sir Edward Dalyngrigge took possession over the land in 1378 by marrying into the Bodeham family. Sir Dalyngrigge was a Knight of the Shire for Sussex and hence a very influential person in the county. He had to make his own fortune as all his father's inheritance went to his older brother. He raised most of his money as a member of Free Companies - a group of mercenaries who fought in France during the first part of the Hundred Years' War. When he returned to England in 1377, King Edward III died and was succeeded by Richard II. As the hostilities renewed, the Parliament voted that money should be spent on defending and fortifying England's south coast. 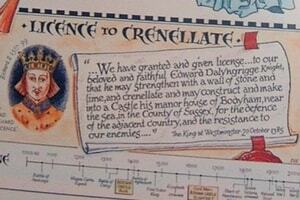 In 1385, Edward Dalyngrigge was granted a license to fortify his manor house. However, instead of refortifying his existing manor house, Sir Dalyngrigge decided to build a new castle on a particular spot in the middle of his land that was perfectly suited for a vast moat. This castle is essentially the one we can see today. Bodiam Castle was built to a simple rectangular plan, with no keep, in the middle of an artificial watery landscape that created a spectacular moat around it. There are four circular 'drum' towers at each of the corners and square central towers on three of the four sides. The main entrance was a twin-towered gatehouse in the northern part of the castle. Anyone wishing to enter via the main entrance would have had to cross the moat using a wooden bridge which first leads to an island in the moat called the Octagon. Between the Octagon and the main gatehouse, there was a Barbican (which was demolished in the 17th century). A second small bridge (probably a drawbridge) was then used to link the small island with the main gatehouse. The passage through the gatehouse would originally have had three wooden portcullises. One of them survived and can be admired by visitors, an extremely rare example of its kind. Therefore, theoretically, attackers who would take on this long approach would have been extremely vulnerable to arrow-fire from the castle. They would first have to make it to the small island using the long and sinuous bridge and then from there to the gatehouse all under constant attack from the towers. The gatehouse itself was filled with numerous traps, including the three portcullises and holes for boiling oil. The second entrance was on the opposite side through a postern gate in the middle of the south wall. The postern gate would have been connected to the moat's south bank by a drawbridge and a long timber bridge. No matter what Sir Edward real intentions were, all the castle's structure, details and situation indicate that display was an important aspect of the castle's design. For example, the area surrounding Bodiam Castle was landscaped when the castle was built, to increase its aesthetic appeal. 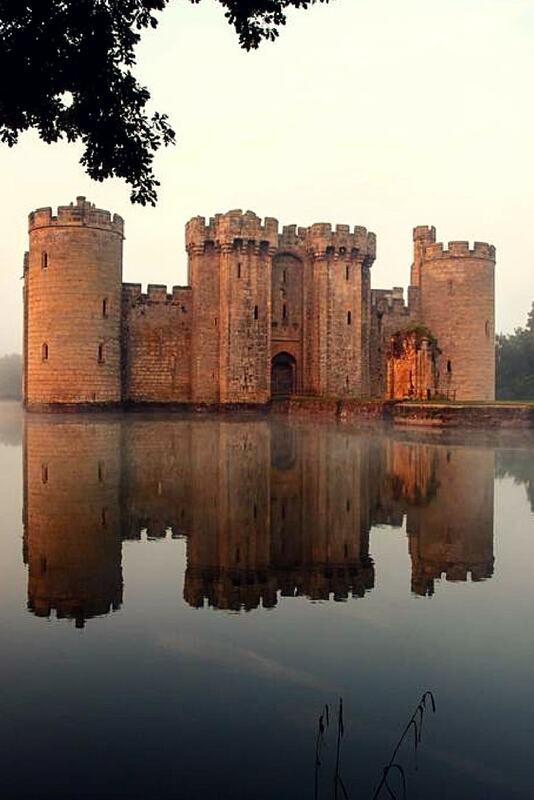 Besides preventing attackers from gaining access to the base of the castle, Bodiam's moat had also the effect of making the castle appear larger and more impressive. Many scholars regard the moat more as an ornamental feature than a defense. It is not precisely known when the castle was finished, but evidence suggests it was completed around 1392. Unfortunately, Sir Edward would not spend much time in the completed castle, as he died in 1395. The entire estate, including the castle, were inherited by Sir Edward's son, John Dalyngrigge. He was also a King's Knight and, like his father, he enjoyed the favor of the king. After his death in 1408, the castle passed through several members of the family until 1470, when Philippa Dalyngrigge (who owned the castle at that time) married Sir Thomas Lewknor, a member of a well-known family who owned land all over the country. That is how the castle passed to the Lewknor family. Sir Thomas Lewknor supported the House of Lancaster during the Wars of the Roses, that began in 1455. When Richard III of the House of York became King in 1483, Sir Thomas was accused of treason and Bodiam Castle was besieged by Richard III's army. Although there is no clear evidence, it is more than likely that Sir Thomas surrendered the castle without much resistance. The property was confiscated and a constable was appointed at the castle. However, the events turned two years later when Henry VII of the House of Lancaster became King. Bodiam Castle was returned to the Lewknors, although part of the surrounding land was not returned to the family until 1542. In the next two centuries, possession of Bodiam Castle passed through several generations of the Lewknor family, but there is little evidence to indicate how it was used during this period. By the start of the English Civil War in 1641, Bodiam Castle was in the possession of Lord Thanet who bought the estate in 1639. He supported the Royalists during the War; as a consequence, the Parliament confiscated some of his lands as well as imposing a large fine on him. To pay the fine, Thanet had to sell the entire estate to a Parliamentarian, named Nathaniel Powell. During and after the Civil War, many British castles were dismantled to prevent them from being reused. 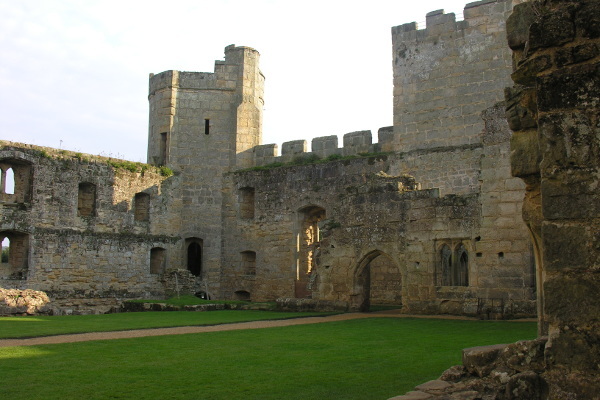 Bodiam had the same faith, but fortunately not the entire castle was destroyed; it was considered sufficient to dismantle the Barbican, the bridges, and the buildings inside the castle. For much of the next 200 years, the castle was left as a picturesque ruin. At the beginning of the 18th century, the site's popularity increased as an early kind of tourist attraction because of its connection with the medieval period. Ruins and medieval buildings served as an inspiration for the revival in Gothic architecture and the renovation of old structures. The castle was eventually purchased by John Fuller who undertook some restoration work before selling it to George Cubitt. Cubitt and later Lord Curzon undertook further restoration works: vegetation, which has been neglected until that time, was finally cleared, the stonework was repaired, and the original floor level re-established throughout the castle. 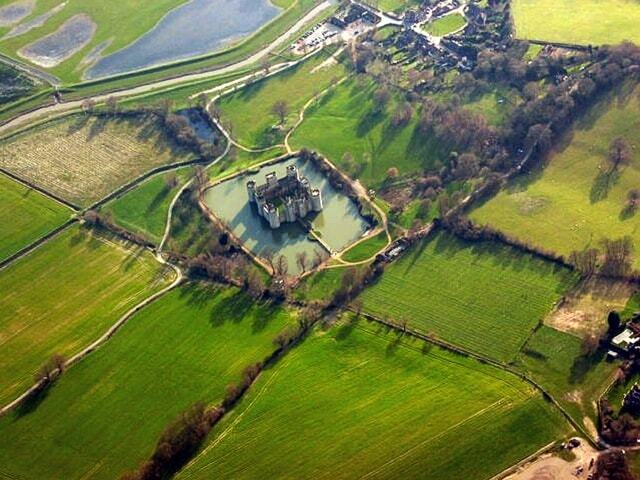 Lord Curzon donated Bodiam Castle to the National Trust in 1925. The National Trust continued the restoration works and opened the castle to the public. 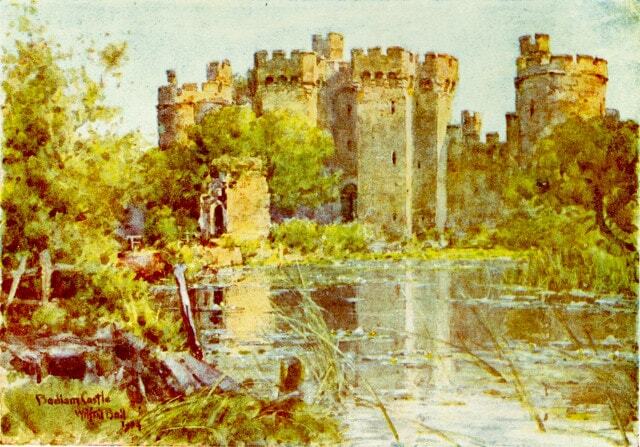 Bodiam Castle: A Formidable Fortress or a Noble Palace? As mentioned, Bodiam Castle is in the center of a debate in castle studies over its true military purpose. As we first look at it (see the original structure), we may think that the castle was designed as a formidable fortress. In fact, some historians do support this theory. Many historians believe that the moat did not pose a serious obstacle to attackers as it could have been drained in a day. It had more of an ornamental role, making the castle appear larger and more impressive. The windows in the upper floors are much too small to be used as arrow-slits. This disproportionate size was intentionally designed to create the illusion that the building is much taller than it actually is. The trick only works if the observer is standing some distance away from the building. The moat also plays an important role here, as it forces the observer to remain some distance from the castle and to be impressed by the effect of the forced perspective. As opposed to the upper floors windows, the lower floors windows were too large and thus defensive weak points. The illusion that the building is taller (hence more impressive) becomes quite obvious when the visitor enters the castle: it is much smaller inside than one can imagine from its outer appearance. There is archaeological evidence that the flat-topped hill that sits behind the castle was used as a viewing platform for gazing down at the beauty of the castle. 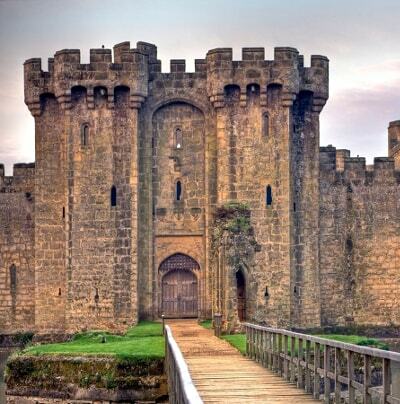 Bodiam Castle is an amazing tourist attraction as it looks almost too romantic to be true. Military historian Cathcart King considers it as "the most complete surviving example of a quadrangular castle". Bodiam Castle is a nationally important historic building and a Grade I listed building, also recognized as an internationally important structure. The castle is open to the public, and according to figures, nearly 200,000 people visit the castle every year. Visitors can admire the amazing landscape that looks just as impressive in real life as it is in the pictures. Although the castle's interior is ruinous, enough of it survived to give an impression of castle life. The impressive gatehouse houses the castle's original wooden portcullis, which is an exceptional element. 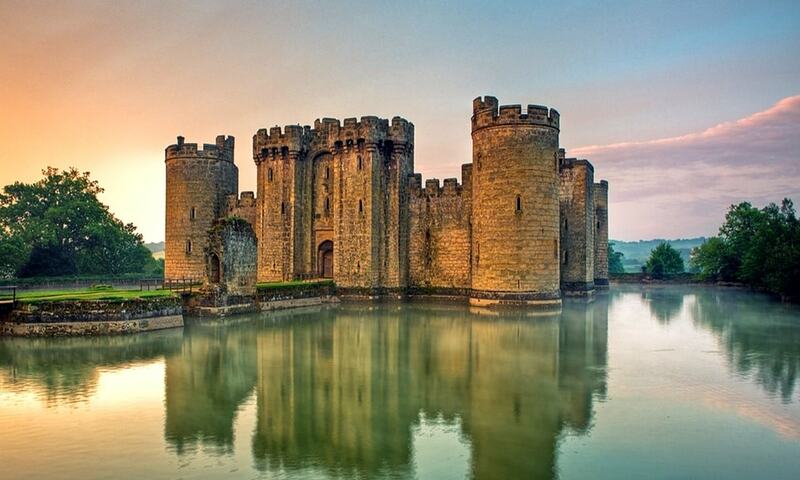 The castle is located on the outskirts of the small village of Bodiam, at the border of East Sussex and Kent. There is a seasonal steam railway that runs between Bodiam and the picturesque nearby town of Tenterden.